Next to Bernie Madoff, the rest of the sticky-fingered CEOs on this list seem like dime-store shoplifters. 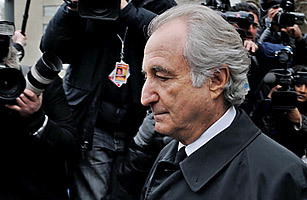 Madoff's decades-long, $65 billion Ponzi scheme, which came to a screeching halt with his Dec. 11, 2008 arrest and earned him 150 years in prison, is perhaps history's biggest financial swindle, and his trademark thin-lipped smile became the defining image of the avarice that last fall nearly brought the global financial system to its knees. What made his deception doubly painful was Madoff's sterling reputationfor years, he was regarded a pillar of the investment community, a taciturn superstar whose clockwork returns had clients nearly breaking down his door. From the 17th floor of the Lipstick Building in Manhattan, the 70-year-old money manager bilked thousands of investors, picking the deep pockets of his country-club counterparts, bankrupting charitable foundations, ransacking tycoons and celebrities alike. When he pleaded guilty in March to federal charges that carry up to 150 years in prison, millions cheered his comeuppance. What we've yet to come to terms with, however, is the way in which his unalloyed greed exposed our own. See pictures of the demise of Bernard Madoff.